In probability theory and statistics, the cumulative distribution function (CDF) of a real-valued random variable X, or just distribution function of X, evaluated at x, is the probability that X will take a value less than or equal to x. In the case of a continuous distribution, it gives the area under the probability density function from minus infinity to x. Cumulative distribution functions are also used to specify the distribution of multivariate random variables. In the definition above, the "less than or equal to" sign, "≤", is a convention, not a universally used one (e.g. Hungarian literature uses "<"), but is important for discrete distributions. The proper use of tables of the binomial and Poisson distributions depends upon this convention. Moreover, important formulas like Paul Lévy's inversion formula for the characteristic function also rely on the "less than or equal" formulation. If treating several random variables X, Y, ... etc. the corresponding letters are used as subscripts while, if treating only one, the subscript is usually omitted. It is conventional to use a capital F for a cumulative distribution function, in contrast to the lower-case f used for probability density functions and probability mass functions. This applies when discussing general distributions: some specific distributions have their own conventional notation, for example the normal distribution. If FX is continuous at b, this equals zero and there is no discrete component at b. 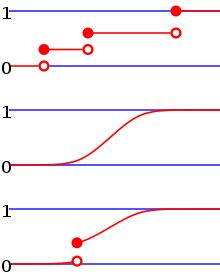 From top to bottom, the cumulative distribution function of a discrete probability distribution, continuous probability distribution, and a distribution which has both a continuous part and a discrete part. Every function with these four properties is a CDF, i.e., for every such function, a random variable can be defined such that the function is the cumulative distribution function of that random variable. for all real numbers a and b. The function f is equal to the derivative of F almost everywhere, and it is called the probability density function of the distribution of X. In survival analysis, is called the survival function and denoted , while the term reliability function is common in engineering. As , and in fact provided that is finite. Example of the folded cumulative distribution for a normal distribution function with an expected value of 0 and a standard deviation of 1. While the plot of a cumulative distribution often has an S-like shape, an alternative illustration is the folded cumulative distribution or mountain plot, which folds the top half of the graph over, thus using two scales, one for the upslope and another for the downslope. This form of illustration emphasises the median and dispersion (the mean absolute deviation from the median) of the distribution or of the empirical results. If the CDF F is strictly increasing and continuous then is the unique real number such that . In such a case, this defines the inverse distribution function or quantile function. Example 1: The median is . Example 2: Put . Then we call the 95th percentile. If has a distribution then is distributed as . This is used in random number generation using the inverse transform sampling-method. If is a collection of independent -distributed random variables defined on the same sample space, then there exist random variables such that is distributed as and with probability 1 for all . The inverse of the cdf can be used to translate results obtained for the uniform distribution to other distributions. where the right-hand side represents the probability that the random variable X takes on a value less than or equal to x and that Y takes on a value less than or equal to y.
Right-continuous for each of its variables. The concept of the cumulative distribution function makes an explicit appearance in statistical analysis in two (similar) ways. Cumulative frequency analysis is the analysis of the frequency of occurrence of values of a phenomenon less than a reference value. The empirical distribution function is a formal direct estimate of the cumulative distribution function for which simple statistical properties can be derived and which can form the basis of various statistical hypothesis tests. Such tests can assess whether there is evidence against a sample of data having arisen from a given distribution, or evidence against two samples of data having arisen from the same (unknown) population distribution. The Kolmogorov–Smirnov test is based on cumulative distribution functions and can be used to test to see whether two empirical distributions are different or whether an empirical distribution is different from an ideal distribution. The closely related Kuiper's test is useful if the domain of the distribution is cyclic as in day of the week. For instance Kuiper's test might be used to see if the number of tornadoes varies during the year or if sales of a product vary by day of the week or day of the month. ↑ Zwillinger, Daniel; Kokoska, Stephen (2010). CRC Standard Probability and Statistics Tables and Formulae. CRC Press. p. 49. ISBN 978-1-58488-059-2. ↑ Gentle, J.E. (2009). Computational Statistics. Springer. ISBN 978-0-387-98145-1. Retrieved 2010-08-06. ↑ Monti, K.L. (1995). "Folded Empirical Distribution Function Curves (Mountain Plots)". The American Statistician. 49: 342–345. doi:10.2307/2684570. JSTOR 2684570. This article is issued from Wikipedia - version of the 10/28/2016. The text is available under the Creative Commons Attribution/Share Alike but additional terms may apply for the media files.